From the IRS: “Thank you for your response to the notice we sent to you about your 2015 (Form 1040) taxes. We’re pleased to tell you that the information you provided resolved the tax issue in question and that out inquiry is now closed.” Previously, they had wanted a few thousand more in taxes from me, because they missed where I had reported income and because they wanted to tax the withdrawals from the 529 account that is paying for my son’s education at UCSB. From Anthem Blue Cross: “Amount charged by your provider $50, Anthem Blue Cross paid $50, You pay $0.” This was for my wife’s flu shot. My flu shot was on last year’s insurance plan, where no paperwork to us was generated, as the flu shot was obviously covered, and there was no deductible to worry about. This year I went with a much cheaper insurance plan that has a high deductible and less coverage. I think that the maximum out-of-pocket cost is still less than the premiums on the more expensive plan, as long as only one of us gets seriously ill. The rather expensive plan is about the equivalent of the free plan I got when I was first hired at UCSC—benefits have steadily been eroding. “Our musings and petitions are with the expired and her family,” he said. My Black and Decker electric lawnmower (model MM1800 type 1) failed again in December, and I finally got around to taking the top off today to look at it. The screws were still a pain to get out, but not as bad as last time, as I now knew to use a vacuum cleaner and a screwdriver to clear out the grass before trying to unscrew the screws. There was not nearly as much buildup of grass inside the mower this time, so a quick pass with the vacuum cleaner was enough to clear it. The problem this time was not the bridge rectifier, which seemed to be behaving properly with about 0.55V drop on each of the diodes at the 1mA test current used by my multimeter. The switch and power connections were all working correctly, so I think the problem now is that the brushes for the motor have worn down to the point where they no longer make contact with the commutator. A new pair of brushes for the mower costs only $9 (https://www.amazon.com/gp/product/B00J5S3PDC/), so I think I’ll replace the brushes and see if that fixes the mower. This quarter, I’m teaching the labs for the Applied Electronics for Bioengineers course in just two sections, despite having 89 students enrolled in the course (the largest offering yet). The sections have 50 and 39 students in them. What I need for the lab is just tables, chairs, power outlets, and enough room to move around and answer questions with 50 students working at once. That turns out to be an amazingly difficult combination to find at UCSC. Almost all the rooms that have sufficient space have fixed seating with no room to move around, and most have almost no power outlets. This year a new classroom was opened up that fits the bill almost perfectly: the Active Learning Classroom (ALC). 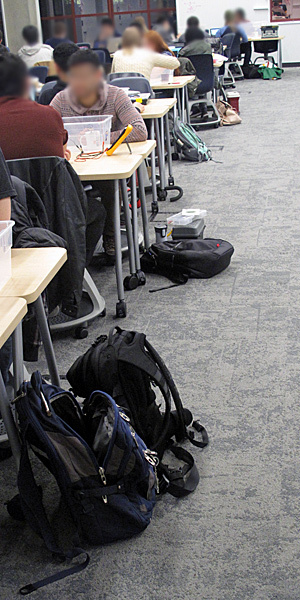 It has a legal capacity of 93 people (including instructors), has movable tables and chairs, and has a grid of floor outlets, as well as wall outlets. The ALC is a bit of a boondoggle, paid for with grant money. They had a consultant come in to design it, and so it has very expensive equipment (12 interactive whiteboards each with a Mac mini, 5 projectors with screens, a fancy lighting control system, video switching to allow any of the whiteboards to be connected to any of the projectors, … ). I’m not using any of the equipment that the consultant put in the ALC—instead I had about $10,000 worth of equipment bought to equip 25 stations. The main expenses were Analog Discovery 2 USB oscilloscopes (which also serve as power supplies and function generators) and temperature-controlled soldering irons and fume extractors. I don’t currently have access to any storage near the ALC, so I’m keeping 9 huge tubs of stuff in my office and carrying the lab setup over every Tuesday and Thursday with a cart. I have to push or pull the cart all the way around the building, because I was denied permission to use the handicap entrance with it—on days when we are using the soldering stations, the cart weighs about 200 lbs, so pulling it up the steep hill behind the building gives me quite a bit of exercise. I’m a little worried that the wheels won’t last two quarters on the rough asphalt—they seem designed for indoor use only. We’ll probably have to get some heavier duty wheels for the cart for next year. 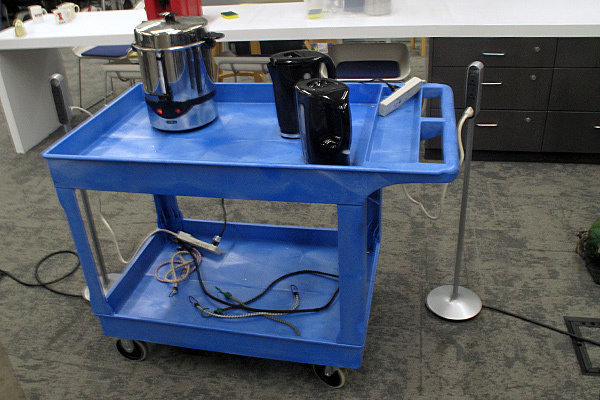 Here is the cart, set up for use in the thermistor lab, where the students need access to boiling water and ice water. It is nice that the cart can serve as secondary containment, as this reduces the number of containers needed. In the picture of the cart above, you can also see a couple of the power towers provided with the ALC (I think that they are Steelcase products). These are very expensive surge protectors with very short cords. At least, I assume they are surge protectors, since they do have circuit breakers with a reset button at the base of the tower. We’d have been better off with some 15′ or 25′ extension cords—at least they would reach the tables from the floor outlets or wall outlets. I did order surge protectors for each station, but either I goofed in specifying them or the staff ordered the wrong ones—I wanted ones with 8′ cords and I got ones with 4′ cords. There are enough floor outlets to make this work, but we often have to move the tables around to get close enough to have every station powered. The tables are a fairly flexible setup of narrow tables on wheels, though there isn’t really time in 25 minutes I have to set up the lab to go around unlocking the wheels and moving the tables. I have the feeling that the tables are not moved in any of the courses that use the classroom. The chairs are expensive “node chairs”, which seem to have been designed by someone who has not recently been in a classroom. They have oversize bases, ostensibly to provide a place for students to stash their backpacks. Of course, almost no one does. (I made a count on Thursday—about 6% of the students used them as intended. Students put their backpacks on the floor, even when it interferes with where they need to put their feet. 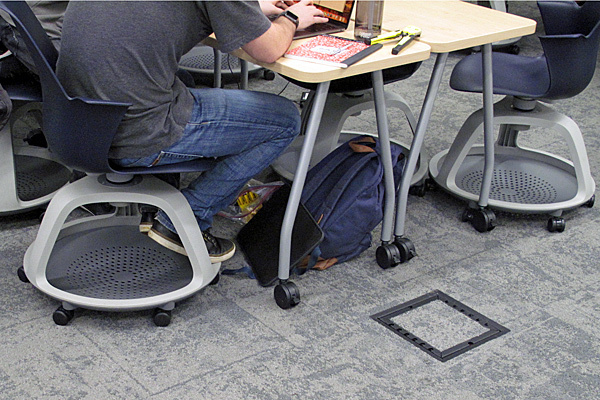 The ends of the tables are a much more popular place to put backpacks than under the seat, where they are both difficult to access and not visible to the owner. It is rather difficult to pass between the tables here, though it would have been straightforward with less bulky chairs. Note: this picture shows one of the rare students using the space under the seat as the designer intended. 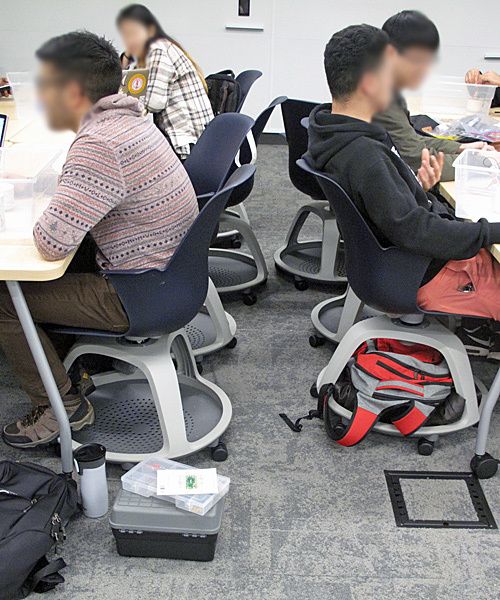 I think that we would have done better with the $40–50 padded shop stools that were bought for the School of Engineering labs, but the consultant apparently preferred the over-$300 node chairs from Steelcase. So far, the labs have gone pretty well in the new space. With 4 people working (me, a TA, and 2 undergrad group tutors), we’ve been able to set up each lab in the 25 minutes we have between the previous class leaving and our lab starting. It is fortunate that I got the last choice of time slots (TTh 5:20–6:55 p.m. and 7:10–8:45 p.m.), because the gap before the 5:20 slot is the longest one of the day—the rest are only 15 minutes, not 25. We’ve also usually been able to clean up and repack everything into the tubs and onto the cart in about 40 minutes, so I’m back in my office by about 9:30 p.m. and home by 10 p.m. to get supper (unless there is urgent e-mail to attend to, in which case I don’t get supper until 11 p.m.). The ALC is somewhat strangely located in the Science and Engineering Library. I’m not quite sure why they still call the building a library, as there are almost no books left in it, no periodicals, no reference desk, and no librarians. Perhaps it should be renamed the Science and Engineering Study Hall, since that, the ALC, and the video game room seem to be all it is used for now. My wife and I try to eat out at least once a week, and tonight was our night out. Before dinner we went to the Museum of Art and History to see the exhibit of Tom Killion’s prints. A low-resolution image of one of Tom Killion’s works, from the MAH website. This low resolution does not do justice to the fine detail of the woodblock print. While we were in MAH, we noticed that Santa Cruz Core Fitness had massage tables and other stuff set out in the lobby—MAH seems to be making a concerted effort to connect with a wider swath of the community, and some of the partnerships they come up with seem a bit strained. We had been thinking of eating at Abbott Square (the courtyard behind MAH) after seeing the exhibit, but the space seemed noisy and uncomfortable, despite having rather few customers. We’ve eaten there a couple of times and never found it very comfortable—the concrete walls make the space too “live” and conversation is often difficult. It might have been ok outside, but tonight felt a little too chilly to us, and their outdoor heaters are not as effective as others around town. Instead we went to Cafe Limelight, a very quiet panini shop on Cedar Street which has very eclectic decor and which we find very comfortable. (The panini are good too.) When we eat there we often see one of my colleagues, so we made a little bet—if he was there we would go for ice cream at Penny Ice Creamery on the other side of Cedar after dinner. As you have probably guessed from the title, he was in his usual place at the counter—I think he may eat there every Wednesday. Over dinner, we discussed MAH’s willingness to pair with almost anyone and started thinking of strange partnerships for MAH’s atrium. The best idea came from my wife, who suggested that MAH partner with a funeral home, which could tie in with MAH’s stewardship of the Evergreen Cemetery. The funeral home could display coffins, headstones, urns, and other funerary art. It could even be an interactive exhibit, inviting people to lie down in a coffin (maybe giving them a little bell to ring?). At Penny Ice Creamery,we each had a mini-double. My wife had candy-cap mushroom ice cream and a buttermilk salted-toffee ganache, while I had pumpkin ice cream and Meyer-lemon with poppy seed. The candy-cap ice cream is about as good as other candy-cap ice cream we’ve had in town (from Mission Hill Creamery), which is to say it had a rather intense maple-like flavor. The Santa Cruz Fungus Fair was last weekend, so this is the time of year for candy-cap ice cream. (We didn’t go to the Fungus Fair this year—we figured that with the very dry December weather, the fungus would not be in peak condition this year.) The pumpkin was good, though my wife claims it is not as good as their gingerbread (which they rarely make). The Meyer lemon with poppyseed was also good with the pumpkin, though I probably would not order it by itself, as the flavor in not intense enough for it to stand on its own (at least not for me—some people may prefer the more delicate flavor). I did not try the buttermilk salted-toffee ganache—my wife reported it as having a good base, but marred by the lack of crunch in the toffee.